The focus all season with Manalapan’s offense has been on receivers Anthony Firkser and Saeed Blacknall and their big-play capabilities. However, in the fourth quarter Saturday at Colts Neck’s McChesney Stadium, with probably the Shore Conference Class A North championship on the line, Manalapan went back to its roots. 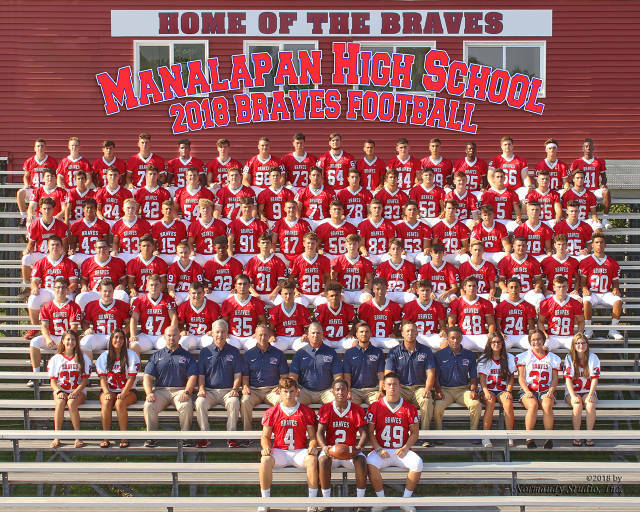 In the current football era of spread offense, big plays and trick plays, the Manalapan High School football team used a tried and true formula for winning in the fall of 2011. The Braves relied on a punishing running attack to wear down opponents and win games in the second half. AS WE ALL KNOW THIS STORM HAS IMPACTED US IN MANY WAYS. IF NOT DIRECTLY WE HAVE FAMILY MEMBERS AND FRIENDS THAT HAVE NOT FARED VERY WELL. WHILE WE ALL SPEND SO MUCH TIME AND EFFORT IN PREPARING FOR A FOOTBALL GAME EVERY FRIDAY NIGHT IT IS SITUATIONS LIKE HURRICANE SANDY THAT BRINGS OUT THE BEST IN PEOPLE. WITH THAT IN MIND COACH GURRIERI IS ASKING THAT THE MANALAPAN FOOTBALL FAMILY HELP OUT WHERE THEY CAN AND SHOW WHAT CHAMPIONS WE REALLY ARE. COACH IS ASKING THAT WE ASSEMBLE AS MANY BLANKETS SHEETS, PILLOWS, AND PILLOWS CASES AS POSSIBLE. MANY FAMILIES IN THE SHORE AREA WITHOUT HEAT COULD USE THESE ITEMS TO MAKE THEM A LITTLE MORE COMFORTABLE. ANY CURRENT OR ALUMNI THAT IS IN A POSITION TO HELP CAN DROP OFF THESE ITEMS AT THE HIGH SCHOOL AT 10:00 am ON SUNDAY MORNING. COACH GURREIRI WOULD LIKE TO THANK EVERYONE THAT TURNED OUT ON SUNDAY TO HELP THOSE IN OUR COMMUNITY IN NEED. IT WAS A TREMENDOUS TURN OUT BY PLAYERS, FAMILY, COACHES AND EVEN STRANGERS THAT SHOWED UP TO GIVE WHAT THEY COULD. WITH THE HELP OF CINDY FORKOWITZ AND THE TOUCHDOWN CLUB UNDER VERY DIFFICULT CONDITIONS MANY WITH NO POWER, NO INTERNET, AND VERY LIMITED MEANS OF COMMUNICATION THEY WHERE STILL ABLE TO GET THE WORD OUT TO THE BRAVES ARMY. WE WHERE ABLE TO GET ENOUGH PEOPLE TO SHOW UP TO FILL 8 PICK UP TRUCKS FULL OF MERCHADISE. ITEMS RANGING FROM BLANKETS, CLOTHING,WATER, COATS, AND EVEN LARGE BAGS OF DOG FOOD. SOME OF THE PARENTS EVEN DROVE AROUND TOWN PICKING UP GOODS FROM NEIGHBORS THAT COULDN'T MAKE IT TO THE SCHOOL BUT WANTED TO HELP. most of its key players are healthy. Shore Conference football previews, 2012: Manalapan's Saeed Blacknall and St. John Vianney's Ishmael Hyman are best friends and top receivers. lineman, made Second Team Offense. The time has come for a change at the top of the Asbury Park Press Football Top 10. Manalapan, which has been ranked No. 2 for the last six weeks moves into the top spot. It is perhaps the first time in Manalapan’s history it has been ranked No. 1 in the APP Top 10. It is certainly the first time this late in the season Manalapan has had the top spot. Manalapan's offense is not one to question. Its play-making receivers, Anthony Firkser and Saeed Blacknall, often draw double coverage from opposing defenses, tailback Tyler Leonetti is elusive, and its offensive line is punishing. When Manalapan walked out of High Point Solutions Stadium last season with a 23-11 loss to Sayreville in the NJSIAA Central Jersey Group IV title game, it did so with the understanding that there was a ton of youth on the field and in turn, the prospects of getting back to Rutgers this season for another sectional final were strong. Freehold Regional High School District history. MANALAPAN — Tyler Leonetti received congratulations from a Hunterdon Central coach Friday night. “You played a great game, pal. Great game,” the coach told the Manalapan junior running back. click on logo for full story. The 2012 scholastic football season will have a lot to live up to. Graduated are two of the most prolific offensive players in Freehold Regional High School District history: Howell High School quarterback Ryan Davies and Manalapan High School running back John Sieczkowski. On a recent late summer morning, before he said a word, Anthony Firkser showed the type of person he is. In the middle of preparing to scrimmage Toms River South, Manalapan head coach Ed Gurrieri called his star wide receiver off to the side. A reporter had a few questions. Like his older brother, 2010 Asbury Park Press Offensive Player of the Year Josh Firkser, Anthony is a bit sheepish and not totally comfortable with any spotlight or accolades thrown his way. With a voice recorder coming out of the reporter?s pocket, Firkser, who qualifies as a physical specimen at 6-foot-2 and a ruggedly-built 220 pounds, needed a slight reminder to take his helmet off before speaking. That?s how introverted he appears to be, but that quality is also what makes him special. Opposing teams will have to make major decisions when they are preparing their defense to play Manalapan. If defenses decide to jam the box against the Braves? power running game, which has produced 2,000-yard rushers each of the last two seasons, they will risk getting burned by the deep ball.